The Rear Steering Assembly has been designed to allow a helper to steer from behind, ensuring both rider and helper are facing the same direction. The steering arm can be adjusted up or down. If requested, the brake lever can be positioned on the steering arm, allowing the carer to apply the brake. The push handle is for pushing or pulling. 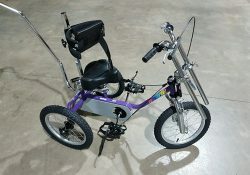 It doesn’t have the advantage of steering the trike but it allows you to stand close to the rider. The Push Me Home Handle is telescopic and extendable. 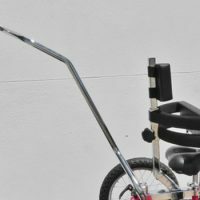 We are proud to stock a range of excellent and affordable tricycle accessories to further assist with the individual needs of our customers.